Think Progress — California has already enrolled about 625,000 Americans in private health plans through Covered California, the state’s Obamacare marketplace, less than four months into the health law’s initial six-month open enrollment season, according to state health officials. That includes over half a million enrollments through New Year’s Eve and another 125,000 estimated signups to date in January. In addition to the private marketplaces enrollments, Medi-Cal, California’s Medicaid program, has also seen a flurry of applications since it was grown to cover more people under Obamacare’s optional Medicaid expansion. More than 584,000 of the poorest Californians were deemed eligible for Medi-Cal between October and December, and another 630,000 were transferred from a temporary (and optional) county-level insurance program for low-income residents into Medi-Cal. Just under 85 percent of Californians who signed up for private marketplace plans through December are eligible for federal insurance subsidies that will help them pay their monthly premiums. Approximately one in four enrollees are relatively young, aged 18 to 34 — largely in line with the federal Obamacare marketplace and insurance companies’ expectations of who would enroll in the health law’s nascent years. The new state-level data also revealed some areas of concern, particularly the slow pace of signups among Hispanics and Latinos. Nearly a third of Hispanics in California are uninsured and just under 60 percent of the approximately seven million uninsured Californians are Hispanic. 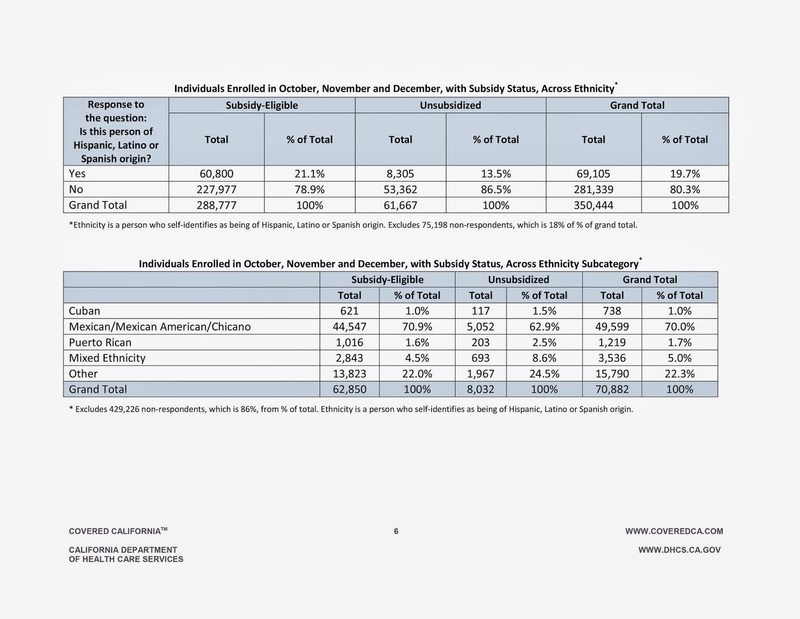 But even though an estimated 46 percent of state residents eligible for Obamacare subsidies are thought to be Latino, just 20 percent of Covered California enrollees to date are Hispanic or Latino. Robust Latino enrollment in the Affordable Care Act is critical, considering that Hispanics tend to lack access to affordable health care and suffer from far higher rates of manageable chronic illnesses like type-2 diabetes. More than 15 million of the 48 million uninsured Americans live in three states with large Hispanic and Latino populations — California, Florida, and Texas — and the majority of the uninsured in those states are Hispanic. This group also tends to be younger than other racial groups, meaning their enrollment in Obamacare would likely add more stability to its marketplaces. The White House is well aware of this reality. Last summer, President Obama touted public-private partnerships between the California Endowment and Spanish-language media outlets such as Univision, Telemundo, La Opinion, and Radio Bilingue aimed at informing young Latinos about the health law during a speech in San Jose. State officials say reaching out to a community that is unlikely to have previously dealt with health insurance is a difficult feat, particularly with a shortage of enrollment counselors who speak Spanish. To date, about 2.2 million Americans have signed up for private plans through Obamacare’s marketplaces.